Five times world champion Anand, who turned 44 on Wednesday, did well to beat McShane who is known as the world's strongest amateur. Anand then followed it up with an easy draw against Adams to share the lead with the latter. Viswanathan Anand put behind the disappointment of the world championship loss and started his campaign by turning the tables on England's Luke McShane and later drew with another Englishman Michael Adams in the preliminaries of the London Classic here. With four rounds still to come in the prelims, Anand and Adams have an identical four points apiece from two games under the soccer-like scoring system in place here. McShane is not far behind on three points, while Andrei Istratescu of France is yet to open his account. With 16 players taking part this year, the Classic is divided into four groups and the top two from each group will reach the knockout stage after a double round robin. Having made a good start, Anand is almost sure to find himself in the knockout stage reserved for top two finishers in each group. Anand started the day as black against McShane and opted for the Caro Kann defense. McShane, agile and innovative as ever, came up with a fine pawn sacrifice in the early middle game putting Anand in a spot of bother and won a rook for a minor piece and pawn. The English Grandmaster was in control of the board but on the clock as the game progressed. Showing some brilliant counter-active measures, Anand converted to a winning endgame with his passed pawns in the center ruling the roost. 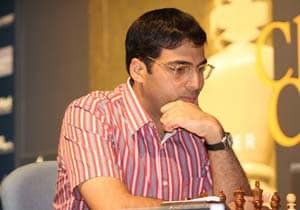 In the second game, Anand could not do much as white against Admas out of a Catalan opening. The pieces got traded at regular intervals and the peace was signed after 40 moves. The other three groups saw emergence of clear leaders on day one although it was a pretty tense day. Russian Vladimir Kramnik was very lucky to score over compatriot Peter Svidler in the first round of the 'B' group and then steamrolled over wild card entrant Jonathan Rowson of England to maintain a clean slate. Rowson is currently second here on three points after he recorded a victory against Matthew Sadler of England. Former world championship challenger, Boris Gelfand of Israel scored a fine victory over Judit Polgar of Hungary in the first round and then crashed through the defenses of Gawain Jones of England to lead the 'C' group with two wins. Fancied American Hikaru Nakamura conceded a draw to Jones in the opener and then defeated Polgar to remain a close second. In 'D' group, Fabiano Caruana of Italy scored two victories at the expense of Emil Sutovsky of Israel and Nigel Short of England. English David Howell is in second spot on four points. Group A: Luke McShane (Eng) lost to Viswanathan Anand (Ind); Andrei Istratescu (Fra) lost to Michael Adams (Eng). Group B: Vladimir Kramnik (Rus) beat Peter Svidler (Rus); Jonathan Rowson (Eng) beat Matthew Sadler (Eng). Group C: Boris Gelfand (Isr) beat Judit Polgar (Hun); Gawain Jones (Eng) drew with Hikaru Nakamura (USA). Group D: Nigel Short (Eng) drew with David Howell (Eng); Fabiano Caruana (Ita) beat Emil Sutovsky (Isr). Group A: Anand drew with Adams; McShane beat Istratescu. Group B: Svidler drew with Sadler; Kramnik beat Rowson. Group C: Polgar lost to Nakamura; Gelfand beat Jones. Group D: Howell beat Sutovsky; Short lost to Caruana. Group A: 1-2 Anand, Adams (4 each); 3 McShane (3); 4 Istratescu (0). Group B: 1 Kramnik (6); 2 Rowson (3); 3-4 Svidler, Sadler (1 each). Group C: 1 Gelfand (6); 2 Nakamura (4); 3 Jones (1) 4 Polgar (0). Group D: 1 Caruana (6); 2 Howell (4); 3 Short (1); 4 Sutovsky (0).